Growing up this was a treat we had fairly often, as it was my Mom's dessert of choice for her birthday, and absolute favorite dessert my Grandmother made. When I was younger my wonderful Grandmother put together a cookbook of recipes for all of her children, to pass on the family recipes through the generations. When I got married to the love of my life, I was so blessed to be given my late Great-Grandmothers copy of this book. I don't know if many of you had the chance to know your Great-Grandparents, and she is the only one I ever knew, but the memories I have of my time with her are so precious. I used to take trips with my Grandparents to go visit her, that's where I learned to sew, and quilt, make the perfect cup of coffee, and I loved watching 2 of my favorite women cooking together in the kitchen. So to receive this book, with my late Great-Grandmothers notes in the margins meant the world to me. I cherish this book, and feel so honored to have it, and hope to one day pass it on to my own child(ren). And while I love the recipes from this book, they are from another time and are loaded with more calories than we like to consume. So I've made it my mission to re-do these recipes in a lower fat way that still taste great, and I started with this fabulous dessert! 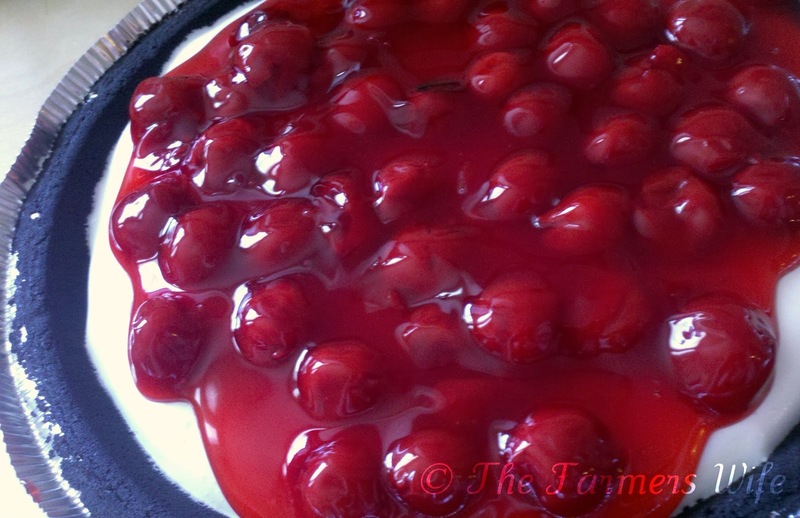 This is not quite a cheesecake, not really a pie, but totally delicious! We loved this dessert, which I made for Easter this year. Next time you want a slightly lighter but still lip smacking good dessert, I hope you'll give this a try! Beat the cream cheese, sugar and extract until smooth. Then fold in the cool whip. Pour into the pie crust, and chill for 1-2 hours until filling is set and slightly firm. Right before serving top with the pie filling, slice and serve. This is so incredibly easy, and such a delightful treat. Great for the summer heat as it does not require an oven! (YAY!) I give this 4 stars. What wonderful sentiments on your great grandma. The Barefoot Contessa once said "No one remembers what the ate for dinner, but you always remember dessert." Thanks for sharing. Fluffy and oh so yummy. I could not resist. What a fabulous dessert...and I love the tweaks you made to lower the fat content! We use to call this Cherry O Cream Cheese Pie and was the dessert that I "required" every year on my birthday when I was growing up!!!!! A wonderful pie! Yours is a little different and I sure quite delicious! Congrats on your 200th post! This sounds amazing! Almond Extract, and cherry filling - perfect together! Great idea about cutting the fat in those old recipe, big project though. Your first one looks like a real winner. Almonds and cherries are a match made in heaven. Congrats on the big 200! Wonderful recipe Kim. I can't imagine knowing my GREAT grandparents...I lost both my grandfathers when I was young, and one grandma before I became a mom. How awesome you have her cookbook. I truly LOVE lightened and easy recipes like this one...plus I'm a cheesecake hound too. Thanks so much Dearie. This is a wonderful dessert, especially the low fat version with the Oreo crust. I have made this many times with just the grandcracker crust, but must try the choclate crust. Thanks for sharing! Love that Oreo crust!Oh and of course the rest of it too! Congrats on 200 post Kim! This sounds perfect, and very delicious! Have a wonderful Sunday my friend! Congrats on your 200th post. What a great recipe to celebrate with. Looks incredible. This is a perfect recipe for this week's Sharing Sundays because our theme is RED!!! We would love if you would drop by and link up this recipe and any other recipes that have RED ingredients such as, Strawberries, Marinara Sauce, Red Peppers, Tomatoes etc. This dessert looks amazing. I love how fun it is to put together!